The housing unit that would deploy a CubeSat. LOGAN, UTAH -- Experts say the big news in spacecraft building involves ultra-small CubeSats. These petite but powerful satellites are spearheading a hands-on revolution around the world. And what fist-sized CubeSats bring to space could mimic innovations sparked by the personal computer here on Earth. To look at them, you don't see much ...and that's a good thing. No massive, expensive spacecraft that has been years in the making and loaded to its sprawling solar panels with super-electronics and other posh payload parts. A standard CubeSat is a motherboard of invention: About a 4-inch (10-centimeter) block of equipment that tips the scale at roughly 2 pounds (1 kilogram). A handful are already in space and with other launches planned for later this year. Peep inside a CubeSat and you'll spot off-the-shelf circuitry in the familiar form of microprocessors and modem ports, and other microchip devices typically used in cell phones, digital cameras and hand-held Global Positioning System (GPS) satellite navigation units. CubeSats will make be easier and more cost effective to deploy into orbit. The American Institute of Aeronautics and Astronautics and Utah State University showcased the pint-sized payloads at the 18th annual Conference on Small Satellites, held here last month. The CubeSat initiative is a global congregation of universities and private firms striving to advance small satellite technology. Of the participating universities, more than 60 percent of CubeSat developers reside in the United States. In June 2003, six CubeSats were lobbed into orbit from Russia's Plesetsk launch site, executed by Eurockot Launch Services GmbH of Bremen, Germany. Later this year, if all stays on track, over a dozen universities from around the world will take part in hurling their CubeSats into space via a Dnper rocket. This launcher -- an SS-18 missile sans warhead -- has been rehabilitated into a "ride for hire" booster offered by ISC Kosmotras. "When we started this, I thought that it made sense for everybody to collaborate," said Robert Twiggs, professor and consultant at Stanford University's Department of Aeronautics and Astronautics and a pioneer in the rapidly growing world of small satellites. "I'm very pleased that it's going the way it is." Twiggs' main interest is in the development, launch and operation of small, econo-class orbiters to do feasibility demonstrations and to space-qualify new and novel components. He is also spearheading the miniaturization of space experiments for low-cost satellite missions. A CubeSat can be built for under $25,000, although they typically come in at the $30,000 to $40,000 price range - still a bargain. The "going-rate" per CubeSat launch is in the $40,000 range. There's already a CubeSat Kit being offered that gives a builder a leg up on turning a space mission into reality - and meeting a launch date "on time and under budget," says one product brochure. Regarding what services CubeSats can perform, Twiggs said that he doesn't have the foggiest idea of what the "killer application" of the little satellites will prove to be. However, as for their utility, he's quick to respond. "The utility to me is to educate the students. The electronics are starting to get better...the efficiency of solar cells is going up...and in a couple of years they're going to be very capable little satellites. I think some good things are coming," Twiggs told SPACE.com. CubeSats aren't built with special parts in huge NASA facilities. "We use everything we can get," Twiggs said. "If you've got lots of room to put everything in, you end up not being too careful with it. That's the challenge. You've got to really think hard when you're putting together a CubeSat." The key to building small is taking the "COTS" approach -- buying Commercial Off-The-Shelf. "I think that's really the way to go," Twiggs advised. For a few tens of dollars you can acquire capability that the "big guys" obtain at mega-dollar prices. Because the industry is new, "we don't know how it has been done so we're less constrained by the established way to solving the problem," said Michael Swartwout, assistant professor of mechanical engineering at the School of Engineering and Applied Science at Washington University in St. Louis, Missouri. "We can now finally play to our strengths...our enthusiasm." Universities have an inherent advantage in developing "disruptive" space systems, Swartwout contends, and that is the freedom to fail. In fact, he added, three of the six CubeSats placed in orbit in 2003 were either never contacted or failed very early. "Experimental failure is a basic element of university life, and from the university's perspective, a failed spacecraft is not necessarily a failed mission," Swartwout said. Swartwout explained that the tremendous reductions in the size and cost of electronics are making possible "disposable" probes that function for only weeks, but whose very low cost and short development cycle make their launch and operation affordable. "Universities are uniquely poised to take advantage of disposable spacecraft, and such spacecraft could be used to develop 'disruptive' satellite technologies," he said. California Polytechnic State University (Cal Poly) in San Luis Obispo is a powerhouse in the CubeSat effort, led by Cal Poly Aerospace Engineering Professor Jordi Puig-Suari. In April, Cal Poly hosted the first-ever CubeSat Developers' Workshop. That event brought together teams in the United States and abroad to network and collectively shoulder ways to reduce CubeSat costs and development time, and review how best to increase their access to space and turn up the volume in terms of launch rate. In addition to overseas launches, CubeSat builders are looking to develop the capability of boosting their satellites within the United States. A campaign is in progress with all major launch providers to assess possibilities for the future. 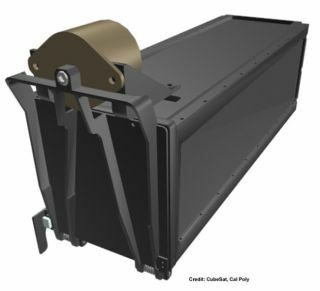 Cal Poly is also home for the CubeSat deployer, the P-POD. All universities involved in the CubeSat program send their spacecraft to San Luis Obispo where Cal Poly students integrate each into the P-POD and carry out testing before transporting them to the launch site. Things are extremely busy at Cal Poly, said Spencer Studley, PolySat Project Manager and student. The launch slated for later this year will include 14 CubeSats, he said, developed by seven teams in the United States and four groups at international universities. The CubeSats will be stuffed within five P-PODs, each carrier device cocked and spring-loaded to deploy sets of the tiny spacecraft. "People are learning as they are building," Studley said. "Between 40 to 50 universities are actually in the process of building CubeSats." Studley said that universities are undertaking CubeSat work for multiple reasons: For their educational value by enhancing student engineering skills, to carrying out science data gathering or supporting a commercial space agenda. According to Bryan Klofas, Cal Poly student and coordinator for the university's Earth station: "There are a lot of universities involved...and lots of far out ideas. You don't need a lot of money to put a satellite in orbit. Smaller is better." Twiggs at Stanford University foresees a burgeoning role for CubeSats. Micro-thrusters could enable the spacecraft to maneuver freely in Earth orbit. New radio and solar cell technology is within reach, also making future CubeSats all the more productive. "And look at the processors. Every time they come out we get more computing power for less power consumption," Twiggs said. The same goes with the PDA, he said, the handheld personal digital assistant. "They are our saving grace. They didn't know it but they're building stuff for us," Twiggs added. Big plans are afoot for CubeSats. There is talk about flying tethers on the spacecraft, as well as toting along inflatable packages - both techniques viewed as a way to hasten a CubeSat's reentry and lessen worry about adding to already orbiting space clutter. CubeSat innovators also envision the small spacecraft deployed from the International Space Station - chucked out of an airlock. Then there is the prospect of CubeSats toting biological or hardware experiments that reenter and parachute to Earth. "I hope the CubeSat is like the personal computer...you don't know what the heck you're going to do with this little box when you build it or what markets will be enabled. But it's so cool, you've got to do it," Twiggs concluded.